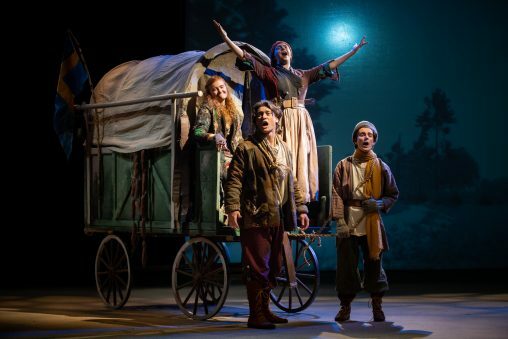 Wright State’s production of “Mother Courage” is the center of a year-long study of “The Cost of War” to be concluded with a roundtable discussion on April 24 and a mini-concert May 1. “Human history becomes more and more a race between education and catastrophe,” said English writer H.G. Wells in the wake of World War I.
Wells’ quote will kick off a roundtable discussion at Wright State University on Wednesday, April 24, about what can be learned from theatre and the humanities about the cost of war. To be held in the Millett Hall Atrium from 4 to 5:30 p.m., it is free and open to the campus community and public; refreshments will be served. The roundtable will feature Wright State faculty and is the culmination of a series of related readings and lectures that also includes Wright State Theatre’s production of “Mother Courage and Her Children.” The year-long project is sponsored by Wright State CELIA (Collaborative Education, Leadership and Innovation in the Arts), the Dayton Literary Peace Initiative and the Dayton Peace Museum. The events and the roundtable are the brainchild of W. Stuart McDowell, professor and artistic director of the Department of Theatre, Dance and Motion Pictures. McDowell expects the discussion to touch on the machinery of war, the impact of war, what creates war, what nurtures war, what keeps wars going and the cost of war to everyone. Besides McDowell, those expected to be at the roundtable include Elfe Dona, associate professor of German and teacher education; Nenad Jovanovic, an assistant professor of media studies in the Department of Theatre, Dance and Motion Pictures; Christopher Oldstone-Moore, senior lecturer and assistant to the chair for graduate studies in the Department of History; John Lavarnway of Theatre; and Jean-Michel Lamoine of Modern Languages. “Mother Courage and Her Children,” performed at Wright State in February, is a play by Bertolt Brecht. It is considered the German playwright’s most passionate and profound statement against war. “Mother Courage” is one of nine plays that Brecht wrote in resistance to the rise of Fascism and Nazism. In response to the invasion of Poland by the German armies of Adolf Hitler in 1939, Brecht wrote “Mother Courage” in what writers call a “white heat,” in less than a month. McDowell intends to use the play as a springboard and context for an open discussion. “Mother Courage” is set during the Thirty Years’ War of 1618–1648, which involved all of the European states and became one of the bloodiest conflicts up till then. It follows the fortunes of Anna Fierling, nicknamed “Mother Courage,” a wily canteen woman with the Swedish Army who is determined to make her living from the war. Over the course of the play, she loses all three of her children to the very war from which she tried to profit. McDowell said he hopes issues raised by the play set the tone for the roundtable discussion. The discussion will begin with the showing of video clips from a rehearsal of the production. McDowell served as chair of the Department of Theatre, Dance and Motion Pictures from 1994 to 2016 after working in professional theatre in New York and California for two decades as an artistic director, actor, composer and translator. He is the Frederick A. White Distinguished Professor of Professional Service for 2018. The Cost of War will conclude with a free concert-poetry jam on May 1 at 6:30 in the Recital Hall of the Music Building.